This review was originally published on Plastiksickness on June 3, 2008. 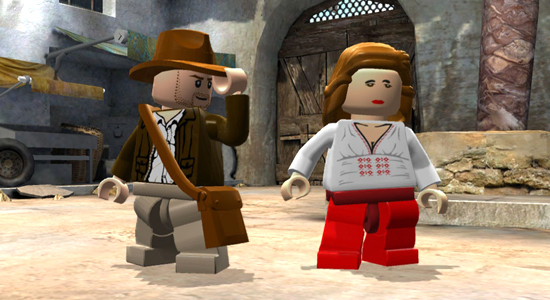 With the release of a fourth movie in the Indiana Jones series comes the newest installment in the Lego Brand game. Instead of using lightsabers and laser guns like in the Star Wars series, you’ll be using Indy’s trusty whip and the help of some of his friends, but does it have enough in it to justify a release? Coming out on June 3rd of 2008, just weeks after the release of the latest blockbuster movie hit, Lego Indiana Jones: The Original Adventures is based on the original movie trilogy consisting of Raiders of the Lost Ark, The Temple of Doom, and The Last Crusade. But with the absence of content from the latest movie hit, is it enough to draw fans in? As I’m pretty sure everyone has seen the Indiana Jones Trilogy already, I won’t go too in-depth on the story, but I will say that the developers, Traveller’s Tales, have done a great job converting the big screen to the Lego scene. 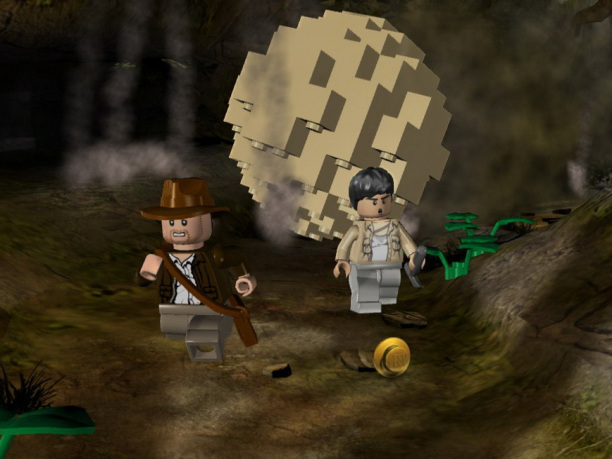 From the same developers who brought you the entire six movies of Star Wars to the world of Lego already come all of the memorable scenes from the three movies that made being an archeologist seem like a decent job. 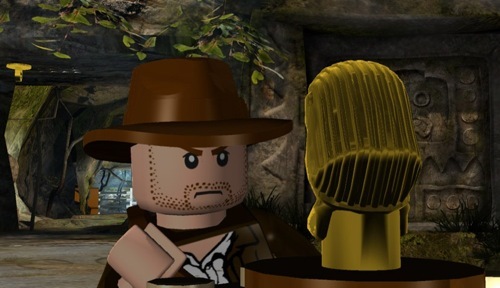 From the discovery of the golden idol in the beginning minutes of Raiders of the Lost Ark to the three tests to find the Holy Grail in The Last Crusade, The Original Adventures is filled with not only memorable movie moments, but also laughable Lego moments that make kids and adults alike chuckle. Some references are just plain humorous without having a point, while others have a definite reason to make you laugh, such as Indy trying to pass off a golden head of C3PO as the golden idol when getting caught outside the temple after the first stage of the game. Throughout the game, you’ll find yourself grinning while the world of Lego allows you to play a part in one of the greatest adventures ever told. Gameplay is the meat and potatoes for any game, and Indiana Jones: The Original Adventures doesn’t let you down. With many items in the game to destroy and many puzzles to solve, you’ll be enjoying this title for hours on end. With having the same free play and story mode like the past Lego games, you’ll be playing through multiple times, collecting different artifacts and mailboxes each playthrough. Like the Lego Star Wars games, you’re given a percentage of how much progression you have made through the game, and while it will take a few times through the different levels and many hours to achieve the 100% status, it is generally easier to do in this game than in the Star Wars games because of the difference in content. While The Original Adventure covers three movies overall and provides a good amount of time on multiple playthroughs, it seems to lack some content in the way of character roles. What I mean by that is that you’ll probably find yourself playing the same group of characters over and over in the free play mode because of not really knowing some of the characters. Or generally feeling that some of the characters were only put in the game to “fill” more roles to expand the number of playable characters. Because the Star Wars Complete Saga contains six movies in all, it seems like that game had quite a few more memorable characters to play during your time, but with Indiana Jones, it seems like the developers were really grasping for characters, even going as far as to include the butler Indy met at the castle in The Last Crusade. While this really doesn’t take away from the overall gameplay, it’ll just make you notice more and more how few characters you actually remember from the original trilogy of movies. 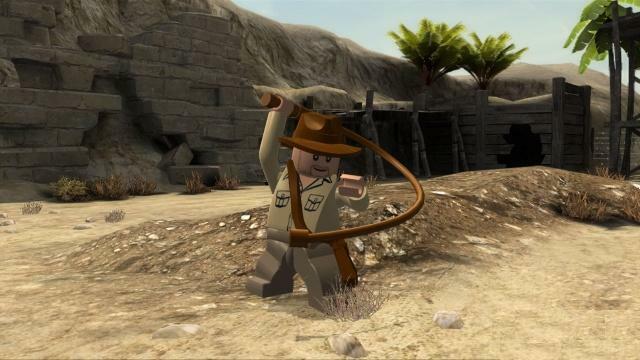 During your gameplay time through the three movies, you’ll have quite a bit of fun using Indy’s whip either disarming enemies, stealing their weapons, swinging across bottomless pits, and even using it to lasso in a female character for a quick smooch in the heat of battle if you want. It’s a different playing style than the Star Wars game, as you’ll find close combat battles very different when using a whip rather than a lightsaber. Sure, pistols in this game feel and act like the laser guns, but the whip and lightsaber are two different weapons in their own right. With the lightsaber, fighting in close quarters was what elevated the fun in the overall gameplay, but while playing Indy and using the whip in close skirmishes with your enemies, you’ll probably find yourself just punching out your enemies more often due to the ease, accuracy, and speed of fists over the whip. While this really doesn’t take away from the Indiana Jones ‘canon’ due to the fact that he spent a lot of time punching his foes out in the movies, this reviewer would have just liked to want to use the whip more in combat. Graphics, as always with Lego games, are done well. Between the different environments and locales you’ll come across, and especially the different characters that you’ll be able to play throughout the games three movie campaigns, Traveller’s Tales did a great job with introducing the younger generation to one of the great heroes. You’ll easily recognize different environments and locales throughout the movies in the game, from running away from the giant boulder chasing you in the beginning moments of Raiders of the Lost Ark to the Middle Eastern deserts in The Last Crusade searching for the Holy Grail. Each and every environment gives enough detail to bring the player right into the movie and have an enjoyable experience overall. Sound in the game is also done quite well, but while the background music will keep you going from level to level, from movie to movie, the voices of the characters, like in the Lego Star Wars games, are just not there. Instead, the game relies on their facial animations and actions told through cutscenes before and after levels to create the sense of a character. The music of each level adds atmosphere to the different scenes, and the noises of the weapons all sound decent. In general, like any Lego game, the sound is sharp and polished. Multiplayer, like previous Lego games, remains mostly the same, with the ability to play along with a friend through the three movies of the trilogy controlling different characters and working together to battle the handfuls of enemies and solve a puzzle here and there. Without a friend to play with, you'll have an A.I. controlled partner who will help out with puzzles when needed and mainly just keep some enemies occupied while you finish off other ones. Overall, it’s a very polished game, much like any other game in the Lego series. Traveller’s Tale took a great action trilogy of a beloved hero and made a great game from it--a game that anyone can enjoy, be it older or younger gamers. With the easy controls, great action, and overall good storytelling, Indiana Jones: The Original Adventures is a good recommendation for anyone who has enjoyed Lego games in the past or would like a game to remember the adventurous trilogy that took you around the globe chasing Doctor Jones. Bottom Line: Taking another beloved movie trilogy and making a fun and entertaining Lego game out of it, Traveller's Tale has certainly done a great job with this latest entry.